NoWinED is a MUI-based TextEditor that can handle more files simultaneously, using different "pages" for each file. 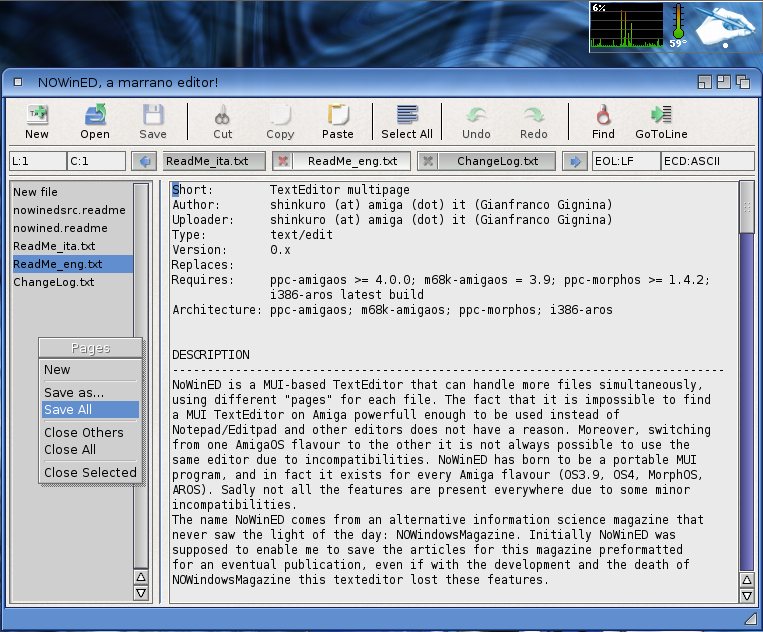 The fact that it is impossible to find a MUI TextEditor on Amiga powerfull enough to be used instead of Notepad/Editpad and other editors does not have a reason. Moreover, switching from one AmigaOS flavour to the other it is not always possible to use the same editor due to incompatibilities. NoWinED has born to be a portable MUI program, and in fact it exists for every Amiga flavour (OS3.9, OS4, MorphOS, AROS). Sadly not all the features are present everywhere due to some minor incompatibilities.